September is Australia’s first month of spring, the season that allows Mother Nature to really show off. It is the most popular month in Australia for weddings and also tends to be a peak travel period, particularly around the school holidays. Though Australia has no public holidays during September, school children are on holiday two weeks of the month. While this means that there are countless activities and things to do that will entertain the young ones, you may find yourself competing for holiday accommodation and paying a premium for flights and accommodation during school holiday periods, so keep this in mind before booking. Unless you're traveling to the more tropical north, or the snowy mountains, Australia has mostly temperate spring weather that is neither hot nor cold. In most states, aside from Queensland and the Northern Territory, average maximum temperatures in the major cities are below the 20°C (68°F) mark. Rain at this time is generally light and infrequent, making it a perfect time enjoy walking tours and other outdoor activities, such as the many flower festivals held all over the country. With idyllic weather conditions, this is the season for all nature lovers to come and explore Australia’s vast beauty. The first day of September has been dubbed Wattle Day, commemorating Australia’s national flower, and there are many festivals celebrating flowers held throughout the month. 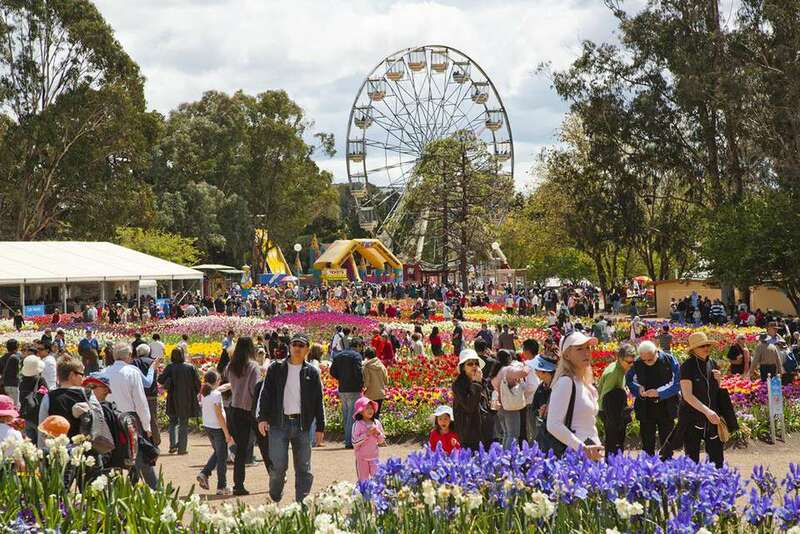 One of Australia’s most notable month-long flower festivals includes Canberra’s Floriade. This festival in the nation's capital is one that celebrates everything that spring has to offer. By showcasing a million flowers in their prime, while also offering plenty of activities during both day and the night, Floriade has something for everyone. The Perth Wildflower Festival is truly a must-see with over 12,000 varieties of wildflowers scattered along meandering paths. Located at Kings Park and Botanic Garden’s it is the most relaxing flower festival in all of Austrailia. If you are planning on visiting Sydney, the New South Wales Southern Highlands celebrates spring with their Bowral Tulip Time Festival. This festival is renowned for its 75,000 colorful tulip bulbs, of course, and wonderful, live musical entertainment in the gardens. Wangaratta Orchid Show celebrates the beauty of these exotic, tropical flowers in all variations with potting demonstrations, advice for growing and maintaining orchids at home, photography demonstrations, and more. If you're more into football than flowers, September is a great time to catch a game. You have Australian football, the National Rugby League and the Australian Football League (Aussie Rules) to choose from, and matches are typically held throughout September in the lead up to their respective grand finals. Watching a football grand final is an Australian rite of passage, similar to watching the Super Bowl. Although it may be on a much smaller scale, seeing a match or game while visiting a must-do for any sports fan.